Prior to Saturday night, Chris Eubank Jr had never been involved in a boxing match which lasted beyond 8 rounds. Despite having racked up 18 wins, his victories had all come against less than stellar, low level opposition. With a virtually non-existent amateur record, Christopher entered London’s full to capacity ExCel arena, having never come close to experiencing an event of such magnitude. By the nights end, the fight is lost only by a narrow split decision (one judge had him winning) in a closely fought battle. Considering Eubank was challenging an undefeated Olympian and holder of British, Commonwealth and European titles, many would perceive his efforts as brave and valiant considering the vast gulf in experience between the competitors. However, when you’re the son of an enigmatic figure considered amongst the most exciting middleweight champions Britain has ever seen and when your dad is making proclamations about you being the most talented pugilist seen since Sugar Ray Leonard who will go on to eclipse the achievements of the world’s highest paid athlete Floyd ‘money’ Mayweather, the judging barometer begins to differ from other fighters. Whereas on one hand you could say it’s unfair his performance has been critiqued so harshly because of who he is, there’s also an argument that it’s in fact his surname which got him into a position to fight for the European title in the first place. Leading into Saturday’s event the question on everyone’s lips was always how good is the younger Eubank? We already knew how talented Billy Joe Saunders was but with the hype that had been steadily building around Christopher, many half expected him to swiftly annihilate “average Joe” and announce himself as a force on the world stage. Unfortunately (for him), this is a far cry from what actually transpired. Eubank’s ring entrance was reminiscent of how his father used to come out – ‘adopting a statuesque pose on the ring apron before vaulting over the ropes’. He glared into the crowd with a lock-jawed expression which on one hand looked focused but could also be interpreted as him being taken aback by the whole event. Amongst the jeers from the crowd, It was notable that his dad’s adopted Tina Turner Simply the Best anthem was replaced with a Dr Dre instrumental (Still D.R.E). Perhaps this was the latest sign of the younger Eubank attempting to steadily emerge out of the elders shadow and establish his own identity. Ultimately, the contest ended up being a game of two halves. For the first 5-6 rounds Billy Joe was dominant utilising his superior outside boxing skills and awkward southpaw stance to great effect. Whilst Eubank never appeared badly hurt, he was often made to miss and look amateurish as he struggled to assert himself throughout these early stages. From around the 7th onwards the champion began to tire and Chris began to find success as he closed the gap turning the contest into the type of rough inside fight more suitable to his attributes. Although Saunders was able to withstand the onslaught he was made to absorb some heavy punishment throughout these latter and more competitive stages. Despite the momentum switching to Eubank, the more desperate he grew the more reckless he appeared as he continued to throw and miss with wild hooks and power shots. Fatigue clearly had an effect on both fighters who were blowing hard from the 10th and ultimately it was Christopher’s inability to find the telling blow combined with Saunders solid groundwork early in the fight which was decisive in enabling the British champion to retain his titles. Throughout the fight particularly towards the end, Chris Eubank Jr displayed enough heart, grit and raw ingredients to suggest he could still have a promising future in the sport. There was never any sign of quit in him. However, we had not witnessed as his dad had claimed during the week, “the most dangerous young man on the planet”. In retrospect it’s easy to see how these type delusional statements may have heaped additional unnecessary pressure on the young boxer’s shoulders. Whether this was a contributory factor to him ‘freezing’ and underperforming during the first half of the contest, we’ll never know. In weeks building up to the fight, father and son adopted almost pantomime-like supremely confident public personas which whilst was entertaining to witness, will not be easy for them to bounce back from. 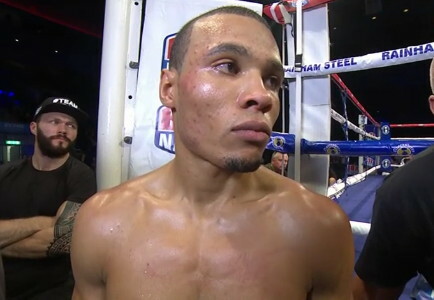 During fight week Eubank Jr turned up to a press conference alone and informed the media he did not need a trainer, that it was all down to him and that he listened to no instructions, Ronny Davies (his trainer) was there to “apply the Vaseline”. Davies clearly appeared to take these comments ‘to heart’ as he was not heard uttering a single word during the fight until at least the middle rounds. Unable to contain his frustrations the corner man began to question “What you doing?”, “You’re losing”, “start bashing him up”, “start beating the fu*k outta him!” At one point Chris responded by telling him to “stop talking” and in another instant Ronny was embarrassingly arguing with his dad. There were signs of disharmony and lack of cohesion in the fighter’s corner. It was at times questionable the role of his sharp suited father who seemed to switch from wolf whistling to clapping furiously to standing on the ring canvass adjusting his cufflinks. This was in stark contrast to the opposite corner where everybody read from the same script offering their fighter clear concise instructions. The measure of every true ‘champion’ is the ability to bounce back from defeat and cope with adversity. Such a setback at this early stage in a young boxer’s career may in the long run prove to be a blessing in disguise. Chris Eubank Jr is now forced to come back ‘down to earth’ and return to the drawing board. Despite the fight being close, he displayed some fundamental novice like flaws in his technique which will need addressing. He’ll also need to make changes in his camp which may involve a more defined or reduced role for his father. Before November 29th Chris was fighting at a journeyman level then skipped the queue to European champion, his next move will more than likely be to take a backward step to educate himself against the contenders at the British domestic level which he skipped. However things unravel, witnessing the Eubank’s rebuilding process and seeing how such a proud rock solid and confident duo return from this humbling process should prove to be in fascinating spectacle. On Saturday night at the ExCel arena the myth and hype surrounding Christopher Eubank Jr ended and now his real career journey begins. You are here: Home / Boxing News / Chris Eubank Jr: The Real Deal?